The Kuzma Minin was grounded Tuesday morning a few hundred feet from a British beach. Smaller boats were eventually able to help pull it free. The 16,000-ton Kuzma Minin was stranded before dawn on Tuesday after it "dragged anchor and grounded," according to the British Maritime & Coastguard Agency. At the time, winds were gusting above 50 miles per hour; a local harbormaster told the BBC that conditions were "very poor." When the coast guard responded to the incident, crews found the enormous black and red ship just a few hundred feet from shore, and battered by high seas. As the sun came up, a coast guard helicopter lowered one of its crew down to help the 18 Russians on board pilot the ship to deeper waters. A small fleet of tugboats arrived, ready to drag the ship back out to sea. By late morning, curious onlookers had flocked to the shore and a beachside café to watch the rescue effort. 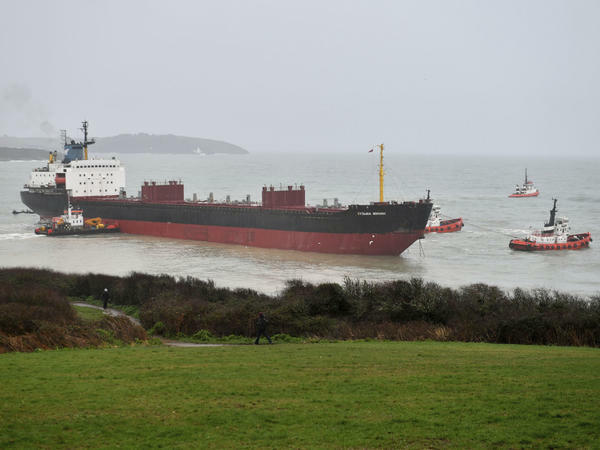 "It is ... important to let the public know that there is no cargo on this ship; we all remember the scenes when the Napoli ran aground in East Devon," police superintendent Matthew Longman said in a statement. In January 2007, the Napoli, a cargo ship several times the size of the Kuzma Minin also crashed off Britain's southern coast. Dozens of shipping containers broke free and washed ashore, a sort unintended late Christmas present. Scavengers got away with cases of shampoo, barrels of wine and BWM motorcycles. "I'm afraid there is no such spoils on the Kuzma Minin ship," Longman said. After a months-long clean-up effort, the Napoli was blown apart with explosives and removed in two large chunks. Tuesday's rescue was decidedly less dramatic and more successful. About nine hours after running aground, black smoke billowed from the smokestack of the Kuzma Minin as six smaller ships helped tug it free. The ship is now able to move under its own power, according to the coast guard, and has maneuvered away from shore. The Russian crew members are safe, and officials say no oil leaked during the temporary grounding. Russia's ambassador to the U.K., Alexander Yakovenko, thanked British officials for their "prompt response, cooperation and goodwill in helping to solve the issue with Russian bulk carrier."